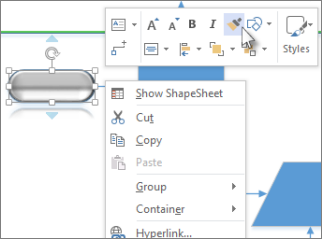 Use the Format Painter tool to copy one shape’s fill and formatting to another with three clicks. Note that Format Painter only copies the visual formatting—it doesn’t touch any data the shape might hold. Right-click the shape with the formatting that you want to copy, and in the floating toolbar, click Format Painter. Your pointer changes to . That means the next object that you click gets the first shape’s formatting. Click another shape. The copied formatting is applied to the second shape. 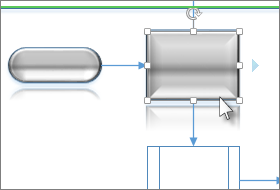 The Format Painter tool turns off automatically when you click the second shape and the formatting is applied. Tip: If you change your mind before clicking the second shape, press Esc to turn off the Format Painter tool. To change several shapes, click the shape you want to copy, then press and hold Ctrl while you click the shapes you want to change. Then right-click and click Format Painter. All the clicked shapes take the formatting of the first shape you clicked. If the multiple shapes are grouped together, click the shape that you want to copy, then click Format Painter, and then click the group. The formatting is applied to each shape in the group at the same time.